You know that Don Young is Alaska's lone Congressman, and the power-full chairman of the House Transportation and Infrastructure Committee. But he's also a top prince of putrid public service; having once bragged about a transportation bill, saying it was "stuffed like a turkey" for Alaska. But Young is like the Japanese-fishing company giants who know no borders to their international product laundering, and he'll smuggle for anyone. First, last year Don put a $10 million earmark into a federal transportation bill to study a freeway interchange in Florida. That was after he held a fundraiser at the Hyatt Coconut Point hotel and town hall meeting at Florida Gulf Coast University in February 2005. The underhanded artifice soon led to a bigger earmark. Additional research showed that in late July of 2005, two credit-taking Florida congressmen announced that the House and Senate agreed to authorize $81.1 million for the expansion of I-75. As a news article reported, "Mario Diaz-Balart, a member of the House Transportation & Infrastructure Committee and a conferee, said: 'Funding for I-75 has always been a top priority for me, so I am thrilled that Congressman Connie Mack and I were successful in getting this done. 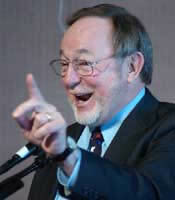 We appreciate Chairman Don Young for helping us shepherd this through.' Mack is also a member of the House Transportation & Infrastructure Committee." On April 16, 2006, journalist Julio Ochoa wrote, "Some believe contributions from that fundraiser hold the key to understanding how the unrequested money for the interchange study made its way into the federal transportation bill, which lawmakers approved last year." The interchange was not in the Lee County's long-range plans, and officials were surprised by that earmark. As Ochoa pointed out, "For some, the contributions are enough to indicate that Young placed the $10 million in the bill based on special interests." And, "To me, it looks very transparent," Lee County Commissioner Ray Judah said. "It's very transparent of what's going on to the detriment of public interest." This is the Washington DC sport, where another congressman or senator slides into home base on a home run hit by a powerful committee chair, from an easy pitch in a rigged Berkshire game. Everyone hopes to find "a degree of separation" - but in the end, the swine themselves grunt accolades to each other in the press. That's how they signal to other campaign contributors, politicians and corporations how beneficial it is to join in the game for pay-to-play muck ball, too. It's a symbol of his Transportation committee power that 84% of Young's contributions come from outside of Alaska. But it is particularly embarrassing in this case that Young sold the Treasury out for $90 million in return for just under $42,000 in campaign nuggets. That's one to make school kids' skin crawl in Civics class. Again, 70,000 Alaska voters have a little waking up to do before this November. Second, when several whistleblowers reported in the late-1990's how the oil companies improperly undervalued royalties paid to governments, Young attempted to find them in contempt of Congress. That's a very rare action. They had each received about $385,000 from their efforts to date, and were engaging in another legal case against Big Oil. But Young demanded they share that case's evidence with the Congress. It was rather obvious he really wanted it to share with the oil companies engaged in underpaying royalties to the state of Alaska - to give them a head start on potential liability lawsuits. The incident was so unusual and Young was so maddened that it forever proved to us his nefarious deal making and who he chose to serve, instead of taxpayers. We expect the Florida deal, along with the Bridges to Relatives' Land, to cement his fate. Later information in the corporate financial statements of the Aleut Corporation indicated that Congressman Young eventually found a bill where he could insert a $2 million forgiveness of that IRS tax debt. It was never noticed by the Alaska media, just as planned. I don't know about you, but I'd call that a conspiracy to defraud the American taxpayers of Treasury funds, and one would think the current Justice Department team would be highly interested in which lobbyist worked on that one. Or does the Aleut Corporation have a direct line with Don Young, just as they did with Frank Murkowski, who removed or redacted City of Adak councilmen testimonies (along with my Adak Power and Electric partner's letter) from Senate records right before his office called the mayor and ordered me off the island in May of 2002? We'd guess that 18 U.S.C. Section 371 applies: Conspiracy to commit offense or to defraud United States; as should 18 U.S.C. Section 1346. But hey, we're just reading the warning labels on the weed killer. The new language granted $200 million `to subsidize gross obligations for the principal amount of direct loans, not to exceed a total of $200,000,000,' for `the purchase of all or part of ownership interests in fishing or processing vessels, shoreside fish processing facilities, permits, quota, and cooperative rights'. We've already heard rumor that one crab vessel owner who also has processor quota rights is attempting to sell them for double the going market rate (for $8 million instead of $4 million) to the Aleut native corporation Tanadgusix (TDX) in the Pribilof Islands. If that is designed to utilize the grant program and profit exorbitantly in the process, might this also be a fraud under the 'honest services' laws, as well as a misuse of federal funds qualifying for criminal sanctions on multiple levels. Who is brokering such deals and is there is a means of kickback to the Congressional agents involved? Was this the intent of slipping the revised language into the Coast Guard Bill? There are other incidents where Young is just another congressman intoxicated on power, but these alone make the case that he well-earns a spot in the Justice probe alongside Ted and Ben, and others (like Senator Patty Murray of Washington). As a reminder, in the last post we included a copy of Bonsai #15 from November of 2004, but here's what Bonsai #14 said in November of 2003 about Crab Rationalization. That Bonsai prognostication piece covers a lot of political ground relevant to many a scheme or artifice to deprive another of a citizen's rights to an intangible known as the honest services of their public officials, and hits at the heart of even a limited scope application where actual property rights are taken. Maybe it upset Chuck Bundrant so much because of the issue of criminal violations for perjury, such as Trident allegedly delivered years ago in a Senate subcommittee hearing, or maybe it was because we'd exposed the public officials at their dishonest pinnacle. Or maybe it's because this is the feared key to overturning all processor quotas - illegally obtained according to common law fraud tenets. Ray Metcalfe concentrated on bribery and corruption, and the federal law (18 U.S.C. section 201 - Bribery of public officials and witnesses) offers us good insight on what's next. "Whoever . directly or indirectly, corruptly gives, offers or promises anything of value to any public official . , with intent . to influence any official act; or official or person who has been selected to be a public official to commit or aid in committing, or collude in, or allow, any fraud, or make opportunity for the commission of any fraud, on the United States; or induce such public official or person. to do or omit to do any act in violation of the lawful duty of such official or person; [or who similarly affects a witness or juror, including in proceedings before Congress] shall be fined under this title [up to $250,000] or not more than three times the monetary equivalent of the thing of value, whichever is greater, or imprisoned for not more than fifteen years, or both, and may be disqualified from holding any office of honor, trust, or profit under the United States." Additionally, 18 U.S.C. Section 371, Conspiracy to commit offense or to defraud United States, will likely apply. It reads in part, "If two or more persons conspire either to commit any offense against the United States, or to defraud the United States, or any agency thereof in any manner or for any purpose, and one or more of such persons do any act to effect the object of the conspiracy, each shall be fined under this title or imprisoned not more than five years, or both." We'd like to emphasize the clarity of the words "any offense" and "any agency." So, unlike the scheming Gulf of Alaska rationalization-as-monopolization proponents, the Justice Department doesn't need any new tools in the toolbox (and neither does the GOA, as the existing "bycatch mitigation toolbox" can work just fine, if the Council will only try it, like the Pacific Fisheries Management Council has.) And the most effective tool for Justice's Public Integrity section for these political cases has often been "honest services mail fraud." Politicians owe citizens "certain intangible rights," and public officials should conduct their affairs honestly - particularly when tangible public properties are involved. Honest service cases rely on a common law fraud concept about property being deprived to its rightful holders by lying. In a major Supreme Court case, the "defendants were "sophisticated attorneys" who had demonstrated a "consciousness of guilt," thus suggesting that they were, in fact, on notice of the illegality of their actions." Re-read that in light of growing concerns over lobbying misdeeds and what the FBI said about those who are savvy about how to use the political process and appropriations. And don't forget that unlike mere intangible services due to constituents, the seafood Rationalization schemes involve actual takings of properties and property rights reallocations - tangible harms. Such cases are more likely to plant new fruits where weeds had overgrown. "The Second Circuit explained that: [t]he elements necessary to establish the offense of honest services fraud pursuant to 18 U.S.C. § 1346 are: (1) a scheme or artifice to defraud; (2) for the purpose of depriving another of the intangible right of honest services; (3) where it is reasonably foreseeable that the scheme could cause some economic or pecuniary harm to the victim that is more than de minimis; and (4) use of the mails or wires in furtherance of the scheme." The term "a scheme or artifice to defraud" is significant in public corruption cases like these, and you might recognize a term from the rationalization proceedings at the North Pacific Fishery Management Council. Frequently discussed, as if council members are always trying to do the limbo under the lowest legal bar, de minimis means 'so minor as to merit disregard.' Not so for Crab Rationalization, with so many victims - from the deckhands to the small businesses devastated in fishery-dependent communities across Alaska's coast. Is it any wonder that Frank Murkowski was attempting to back off on GOA Ratz, to quell the citizen and fleet revolt, and give "uncle Ted" and double-dealing Don a chance to slide in a statutory legislative end-run, to make what might otherwise be illegal a new law? But, pre-arranged quota sales, buyback linkages, denials of crew input, and other aspects of Crab Ratz look a lot like conspiracies to defraud. And so does everything that has happened for GOA Ratz. And the State's recent delegation to DC to lobby for removal of voluntary participation, in order to force boats to participate in cooperatives linked to key large processors lobbying for the bill, just one more "as if legal" step in the conspiracy to destruct the free market. Under statutory law, fraud convictions are obtained when public servants commit illegal acts to attain their purposes. But under common law, a series of what would otherwise be legal acts can be designed to meet an illegal end. "It is sufficient if only one person conceives the scheme and the others knowingly, voluntarily and intentionally join in and participate in some way in the scheme's operation, in order for such others to be held jointly responsible." For example, Ben Stevens was not acting alone. So it matters not that each member's vote on a marketing board or fish advisory panel or council was in and of itself legal, if it was designed with malice aforethought to deprive others of their 'fair and equitable share' of fishery rights. Federal prosecutors take on state crimes in the federal courts, especially when it is the prosecution of state officials and those who serve on agencies and boards distributing federal funds, at intergovernment programs with the states. What happened at the AFMB and in rationalization was not simply "sweetheart deals" and there has been a wholesale disregard for the public process, and a reckless indifference to the truth. Yeah, I left out the particular statute on that one. You can read about it when the Feds convict. The IRS just got GlaxoSmithKline for $3.4 billion in the biggest U.S. tax settlement ever, a fraction of the abusive Transfer Pricing tax evasion committed. But what has happened in Alaska is about $2 billion a year in resource theft from the fishermen, the local communities, and tax coffers across a region highly dependent on those jobs in a real sense. It is not a matter of a minor effect on the stock price, as GSK brashly announced (saying in effect "Crime pays! "), as if taking lessons from Exxon's aloofness. But the days of corporate hegemony are under risk when it is their cronies, the weeds in the U.S. Congress and the lobbyists and the dozens of quisling crooks beneath them, who have to finally face the People's gardeners' hoes of Justice. Last Friday, Ohio Republican Bob Ney resigned, and on October 13, he will plead guilty to a conspiracy to commit fraud, and making false statements to cover the scheme, and violations of lobbying rules. Interestingly, he had to resign from a fox-sitting position on the Franking Commission that "governs lawmakers' use of public money to express sometimes political opinions." Earlier this month, a news release about the Public Integrity Section's work illustrates how such cases proceed. "On September 6, 2006, in Chicago, IL, former Illinois Governor George H. Ryan was sentenced to 78 months in prison and ordered to pay $603,048 in restitution for his conviction on racketeering conspiracy, filing false federal tax returns, income tax fraud, mail fraud and other charges. Ryan was indicted in December 2003 by a federal grand jury and convicted on 22 charges in April 2006. Ryan accepted payoffs in exchange for awarding state contracts, interfered with the administration of tax laws and filed false tax returns for tax years 1995 - 1998 by substantially underreporting his income." We hope this catches our fans waiting in King Cove and Sand Point up on things. Be patient; and sip on a heady salmon berry wine. And meanwhile, Good fishing!